The flagship restaurant of chef Peter Merriman - one of the founding members of Hawaii Regional Cuisine - Merriman's Market Café has long been one of the Big Island's best culinary treasures. 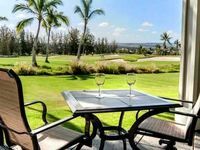 Located at the Waikoloa Beach Resort in scenic upcountry Waimea, Merriman's offers its patrons a selection of Italian/Mediterranean cuisine, most of it inspired by the famed chef. Having been named "Best Big Island Restaurant" by Honolulu Magazine for 15 years in a row and having received the Wine Spectator's Award of Excellence for more than ten years running, Merriman's Market Café has also received praise from The New York Times and The Los Angeles Times for its locally sourced food and exciting menu. This restaurant really is where Hawaii Regional Cuisine originated and it does showcase many of Hawaii's authentic flavors, which are available for one and all to sample. The menu at Merriman's features a range of produce this is either locally-grown or reared; the freshly-caught fish comes from the ocean around the Kohala Coast, the meat from grass-fed cattle, and as much other fresh produce as possible from local farms. Each ingredient is specially selected and represents the myriad of flavors and bountiful harvest that Hawaii has to offer. The fish and meat are prepared in quite distinctive ways so that the cuisine is entirely representative of Hawaii's multicultural nature. The result is a menu that contains a number of signature dishes, all of which showcase authentic Hawaii Regional Cuisine at its finest. Kahua Naturally Raised Lamb and Classic Wok Charred Ahi are just two examples from Merriman's menu. With both indoor and outdoor seating and a fully-stocked bar available, Merriman's Market Café is open seven days a week. Lunch is served from 11.30am until 1.30pm on Mondays through to Fridays and dinner every night (Monday through to Sunday) from 5.30pm until 9.00pm. Brunch is available on Saturdays and Sundays from 10.00am until 1.00pm. In addition to the eat-in facilities, a take-out menu, featuring steaks, fresh fish and other fare, is available. 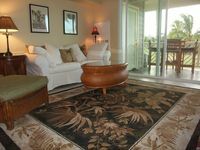 Walk to Beach, one bedroom one bath condo on the golf course with garden/mountain view, Fairway Villas D2, In Waikoloa. 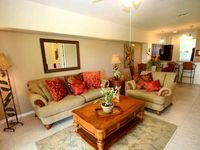 Walk to Beach, handsome one bedroom two bath condo on the golf course with garden/mountain view, Fairway Villas D5, In Waikoloa.